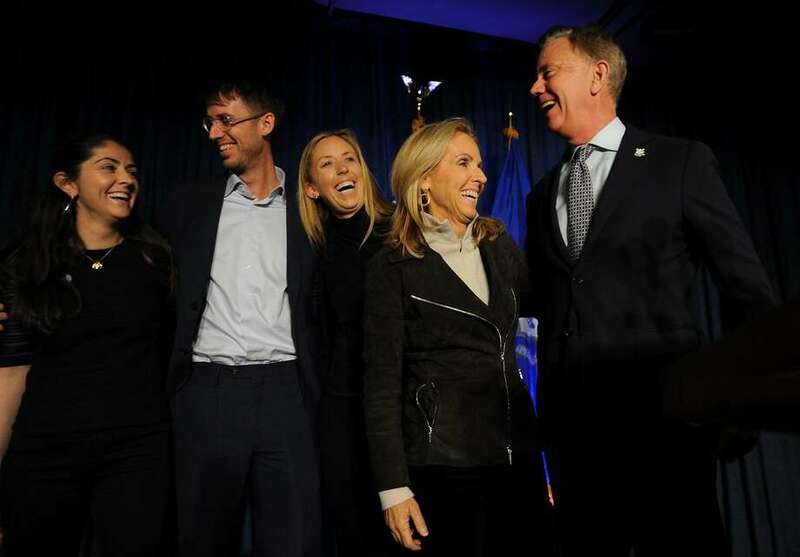 Governor-elect Ned Lamont, right, celebrates with his family after his victory at Dunkin Donuts Park in Hartford, Conn. on Wednesday, November 7, 2018. From left are daughter Emily, 31, son Teddy, 25, daughter Lindsay, 27, and wife Annie. HARTFORD — Empowered by another Democratic trifecta and the largest legislative majority since 2012, Governor-elect Ned Lamont is armed with significant political capital, but also the weight of a state verging on fiscal meltdown. After hours of waiting, Lamont emerged victorious Wednesday morning, winning by a slim 18,530 votes according to unofficial results. Along with Lamont, 24 Democratic state senators and 92 state representatives will take office in January, handing them a hefty two-thirds majority in the Senate, which was previously tied. And while Gov. Dannel P. Malloy has at times had a bristling relationship with his legislative partners, Lamont emphasized Wednesday his administration will be focused on “working together” with Democrats and Republicans, labor and business leaders, and even his opponent Republican Bob Stefanowski to bring change to Connecticut. 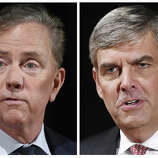 After a nail-biting election in which almost 645,000 cast ballots for Stefanowski, a candidate whose primary campaign pledge was to eliminate the personal income tax, Lamont admitted that raising taxes to solve Connecticut’s fiscal straits will be a recipe for intense unpopularity. Historically high turnout, wet ballots, long lines in cities and some minor controversy over “election irregularities” delayed a final call in the Connecticut governor’s race until Wednesday morning. Stefanowski conceded to Lamont a little before 9 a.m. Wednesday, then called in to the Chaz and AJ radio show on classic-rock station WPLR, where he wished success to the state — and Lamont. 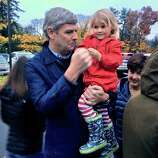 “After a long campaign, he could not have been more gracious, and I could not be more appreciative,” Lamont said. Asked if he would consider running again, Stefanowski said he’s not ruling it out, but needs time to decompress. Addressing the state’s projected $2 billion budget deficit in the next fiscal year will be at the top of the to-do list for Lamont and legislators when they return to the Capitol on Jan. 9 to begin crafting the state’s next two-year budget. “I suspect there will be some changes in tax policy, but whether that includes increases remains to be seen,” said Senate President Pro Tempore Martin Looney, D-New Haven. Lamont, Looney and Democratic leaders of the House all spoke favorably on some form of highway tolling to bring revenue to the state. Passing toll legislation was a particular priority of Speaker of the House Joe Aresimowicz, D-Berlin, in 2018, but Democrats did not have enough support in the 80-71 House to call the bill for a vote. He repeated the need to find money to replace failing transportation infrastructure when speaking to reporters at the Capitol on Wednesday. Besides some tolling and raising the state’s $10.10 minimum wage — another key priority for the governor, Senate and House leaders — some of the top items will depend on the will of the General Assembly’s newest members. “I’m going to wait until I hear from the caucus,” said Aresimowicz, who won his race by only 38 votes. Of the 92 Democratic state representatives who were elected, 24 will be newly elected, including 12 women. “It is a diverse caucus,” said Aresimowicz. In Fairfield County, House Democrats were surprised by several victories over Republicans by candidates Anne Hughes of Easton, Raghib Allie-Brennan of Bethel, Lucy Dathan of Norwalk, and Stephen Meskers of Greenwich, who broke Republicans’ century-long hold on the three Greenwich House seats by defeating Rep. Mike Bocchino. Senate Democrats also exceeded their expectations by winning five new seats, growing the caucus to 24, said Looney. Women will be 10 of the Senate Democrats in 2019. Senate Democrats also pulled off big upsets in Fairfield County, most notably the victory of 22-year-old Will Haskell over Republican Toni Boucher of Wilton, along with Julie Kushner in Danbury, and Alexandra Bergstein of Greenwich.